The emerald ash borer is an invasive beetle originally from Asia. It was first noticed here in the United States in 2002 after ash trees in the Detroit area started dying off in unusual numbers. An investigation revealed it was the tree deaths were the result of damage from the beetles -- and all native varieties of ash trees are susceptible. The ash borer has since spread from Michigan through the Midwest, Northeast and Canada, despite efforts to halt the spread. And it was first recognized in Albany last year. "It's come on us quicker than we hoped. We've been watching for it for a few years," says Tom Pfeiffer, who's been Albany's city forester for 27 years. "When we confirmed it last year on Mapleridge Avenue, and then found out it had been there for as much as 3-4 years before we discovered it, meaning it had gotten established and moved to other trees in the areas." Pfeiffer says the city then confirmed the beetles had established themselves in spots such as Townsend Park near the intersection of Central Ave, Washington Ave, and Lark Street, as well as Lenox Ave near Buckingham Pond. The impact could feel especially significant because many of the city's ash trees are in clusters. For example: The eastern end of Townsend Park includes a handful of ash threes -- they help define the outline of the park. And Pfeiffer said they'll probably all be coming down because of the beetles. A NYS Department of Environmental Conservation map of emerald ash borer quarantine boundaries around the state. "Part of this was to manage our removal of trees, to take care of some of the largest trees, and spread out our needed response," he explained to us. "Because it would literally be too much for us to take down those trees at one time. And we can ease into, and hopefully get new plantings in those areas so that you wouldn't have that bang of losing the whole area." Pfeiffer said one of the lessons of the emerald ash borer's arrival is the need for diversity in the types of trees around the city. Having a wide variety of trees is a hedge against disease, invasive species, and storm damage. But uniformity in design -- of size, shape, pattern, type -- can be seductive. "That aesthetic really needs to change," Pfeiffer said. "I'm guilty of it, we've used it. People like it, the solid look of a canopy of trees down a street. And it is impressive to see overarching maples all the way down your street. But now we've had the double experience -- the nation lost elm trees by the thousands [to Dutch elm disease], which were heavily used in the streets. Now we're seeing the ash trees [suffer]." "That aesthetic [of uniformity] really needs to change. I'm guilty of it, we've used it. People like it, the solid look of a canopy of trees down a street. And it is impressive to see overarching maples all the way down your street. But now we've had the double experience -- the nation lost elm trees by the thousands [to Dutch elm disease], which were heavily used in the streets. Now we're seeing the ash trees [suffer]." If your bet on one type of tree loses, it loses big. Pfeiffer pointed to Woodlawn Ave in the New Scotland neighborhood where the city has been taking down a bunch of mature silver maple trees. He says that species has fallen out of favor among city foresters because it tends to spread out and hollow out, making it susceptible to storm damage. And during Irene, silver maples on the street crashed down, taking out power lines and snapping utility poles. "It was a mess up there. And the trees were in tough shape. And it's something we need to avoid," Pfeiffer said. Another angle for changing up the mix of the city's trees: age. Some areas of the city's uptown neighborhoods -- such as the New Scotland and Helderberg neighborhoods -- have tree stock that was planted about the same time as the housing was constructed. Those trees -- many of them Norway maples -- are now reaching the end of their lives at roughly the same time, concentrating the loss of trees. "One of the good things is to create an uneven age stand so that we're not losing everything in one shot, going from full tree coverage to clear cut," said Pfeiffer. "Where you can have some trees that are full size and younger ones in there so that you have more of a mix. It retains a more consistent tree coverage." 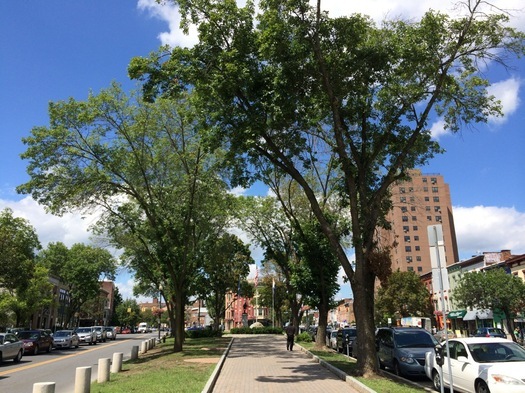 The city of Albany currently offers about 20 different types of trees for street planting. You can take a look at the menu online -- it's subdivided by tree size, and varieties are tagged whether they're suitable for planting near power lines. The cost of planting a new street tree is split by the city and the property owner -- it typically costs the property owner between $100 and $150 for a tree. 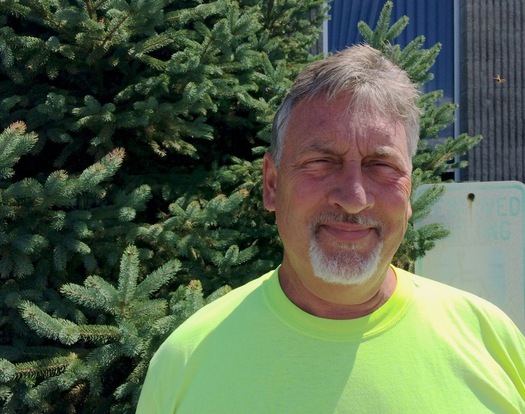 Tom Pfeiffer said having people chip in for the cost of the tree does two things: 1) City budgets are tight and the cash helps cover the city's costs, and 2) Getting people to contribute something out of pocket helps people feel invested in the tree, so they're more likely to care for it, especially when it's young and needs watering. There's no perfect street tree, a fact illustrated by the Callery pear. Pfeiffer said the trees started to become very popular as street trees a few decades back: "Great leaf shape, color, form of the tree was just so super that everyone wanted to use them, all over the country. So we did. We found after a few years that it has a few issues. The branching pattern tends to split under a snow or ice load. So it's a challenge here in the Northeast to use them. We've had different ice storms and lost beautiful trees. So we're kind of moving away from those a little bit." "It was something I wasn't aware of," Pfeiffer said of the trees' rather distinctive odor. "Then we had a very warm spring day and I said, 'What is that smell? It smells like cat piss.' The temperature was about 90 and it just made that odor come out. These trees that we had so many of all of sudden... oh, my god, what did we have? So that fell off my list right about then." One thing that Tom Pfeiffer said during out conversation that really stuck with us was the idea of trees as infrastructure. Trees provide shade and reflect sunlight, helping to cool parts of the city. They soak up water, helping to mitigate problems associated with storm water. There's even research that points towards trees helping to foster more successful business districts. 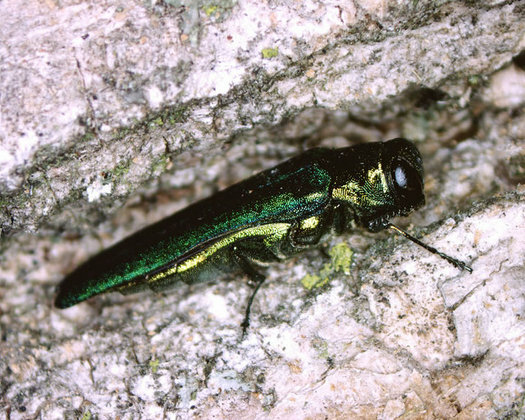 "We look at that the infrastructure as being the street pavement, the curb, the sidewalk, the telephone pole, the street signs," Pfeiffer said us to while discussing some of the implications of the ash borer's impact on city ash trees. "The trees are not just a pretty thing -- they're delivering so many benefits. ... So getting replacement plantings out there will be important for our streets." Great interview! Really eye opening about things I never thought about -- such as our aesthetic desire for the uniform "boulevard" style of same type trees, I never thought about the diversity issue, or the desirability of trees of different ages. I have to admit my heart broke when years back most of the mature trees on Lark St. were cut down (savagely, I thought). New comers probably don't remember Lark St. from that era, but those trees gave it the feel of a village. It never got its charm back. Clearly there are ecological reasons some trees have to come down, but the city looks less lovely with the loss of each tree. Hopefully property owners will systematically replace those trees. However, I have neighbors who have cut down trees simply because they don't want to rake the lawn. It should not be the responsibility of the home owner to decide whether they replace the tree in front of their house or not. That should be the city's responsibility. As you can see, many people choose not to replace a tree that was taken down and now there are voids everywhere on our streets. The trees make the street; the loss of trees takes away the beauty and the value of your home. Also, the trees that the city recommends are not all good choices. I realize the city is concerned about the power lines but with proper tree management, many larger trees can be used. 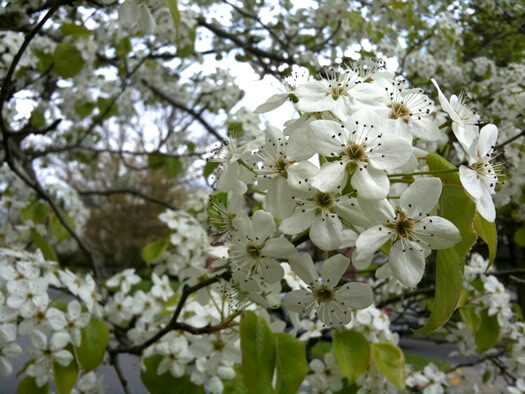 Hawthorne, serviceberry, choke cherry and crabapple? Beautiful trees for your back yard, not for the street. Number one, a couple of these trees only grow 20 - 25 feet meaning it is going to be flat sided on the road side (for vehicle clearance). Number two, all of these trees have berries and some you don't want to park your car under when they are ripe. Clearly a much better system can be implemented and a better tree selection should be created. Great article. Another one of those seemingly small AOA stories that I end sharing. I wonder if there is also a problem with the hemlock woolly adelgid, an invasive aphid-like insect that is also of major concern in the Eastern US. I have noticed one very old/large tree in the Melrose neighborhood that is severely infested. I'm sure it's more of a problem in forests outside the city... Do we have many urban hemlocks in Albany? Have the city contact the Northeast Woodworkers Association. Maybe they would like some of the wood instead of going to the landfill. @Dave -- I'm certain the cut trees don't end up in the landfill. It's made into mulch and wood chips by Dept. of General Services for their own use and also available free to residents. Very good article although it makes me sad. The city should make it a priority to replant after trees are taken down. I agree with the other poster, don't leave it to the property owner to decide. Anyhoot, what are some good choices for street trees in the Albany area? Meg S: I know of several infestations of wooly adelgid in Pine Hills/New Scotland Neighborhood, including in my own yard. We pay for injections, but it's an unsustainable cost for many. That'd be an interesting consideration now that Albany is rethinking zoning ordinances. I'd be in favor of a "Tree Fee" via special assessment on all properties - including all the tax exempt - in the City, which would give the department the funds they need to adequately care for our street trees. A dollar amount per foot of street frontage would make it fair. It also would not have to be much as it would include much more property than our regular property taxes here. And yes, I am a homeowner who pays the high taxes here. But an extra $40 a year is not going to break me, and would provide immense benefit to the city at large. Regarding the trees in Townsend Park, I don't see how these are unworthy of the treatment. These trees in particular are more important than the average street tree due to their location in a small park at what is the entrance to the city for many people. It seems that even if the treatment is only good for a limited number of years, this provides the opportunity replace the trees in the park slowly, one or two at a time, and then finally letting the final ash trees be cut after newer trees have had the opportunity to grow a bit. (Additionally, here's hoping they take Scott Jackson's comment to heart and use some nice, big, shady, non-wimpy trees.) This would keep more consistent cover and shade over the park. Something more than a response of "oh well, screw it" is warranted for such a prominent (and beautiful) spot in the city. Dear Beth re Tree Fee...I love tree and nature, but .... I just got my city tax bill....FO! This obscene government CANNOT take any more money out of the people of this city. I am getting charged $587 yearly for the Library still.....that's $196 per book that I take out every year. I could hire a LIMO to bring my garbage to the dump every week with what I get charged in taxes!! Yeah yeah I know the public schools are awesome and the roads are as smooth as butter not to mention the excellent health care......just drove past G. Jennings house...must say the in ground pool looks great!!! Surrounded by NICE trees! Wake the F up people! Hey, BS -- you must have a pretty nice house if your library tax is $587. Mine is less than half of that. $241 and it's the tax I'm happiest to pay because I get real value from it. Maybe you should try to get a bigger bang for your buck (587 of 'em) by seeing how much the public library has to offer. Was waiting for that pathetic reply! The library system here is nice but no better than anywhere else in the world with a more sane and equitable tax structure! For the love of God inmost counties when you buy a house you are not forever indebted to the government for life! Including the old Soviet Union!lThe petty people around here with chips on their shoulders and a contempt for anyone that works hard to buy a nice house is so off the charts it amazes me. I have work hard throughout my live to buy a house for my family please do not begrudge me for my efforts. I assume you too must be on the government gravy train with your typically Albanian snide remarks. Our property taxes go UP yearly and that is NOT right no matter how much you say! Period end of story! I'd like to add one more voice in favor of a municipal tree fee. It would be well worth the $40 a year (or even more!) to make the city a more beautiful and livable place. High taxes or not, we have it pretty good here, and I would much rather live in Albany than many other places, even at a fraction of the tax rate. Fair enough, Greg. To bring it back to the trees -- and the idea of a tree fee (which is how this got connected to taxes), I would say I'm with BS as being against such an idea because I don't like the precedent of breaking out specific fees (taxes) on what seems like an a la carte basis (inc. the above discussed library tax). I think it's just a bad idea generally to "itemize" the general tax for specific services, whether it's trees, libraries, or garbage pick up. That's what a city budget is for. JayK -- next we'd be paying a municipal tulip bulb fee. Chrisck, tulip bulbs are already taken care of. Street trees clearly are not. Actually, special assessments are routinely used by cities all over the country to cover things that might not seem like "necessities". And again, they can be levied against tax exempt property, which in Albany as we all know is a significant chunk. It's a way to get those properties to help with the upkeep of the city, which is why I suggest it. If we used more of them, more real property in the city would contribute, lessening the burden on us homeowners and small businesses.